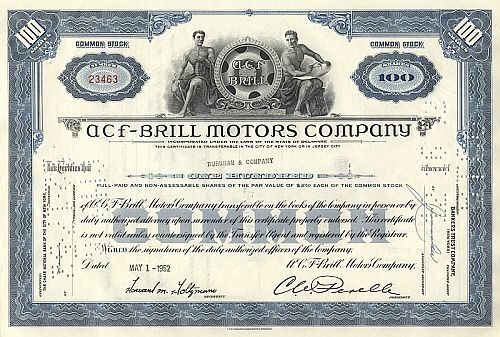 ACF-Brill Motors Company Old stock certificates, US stocks from Railroads from the USA . 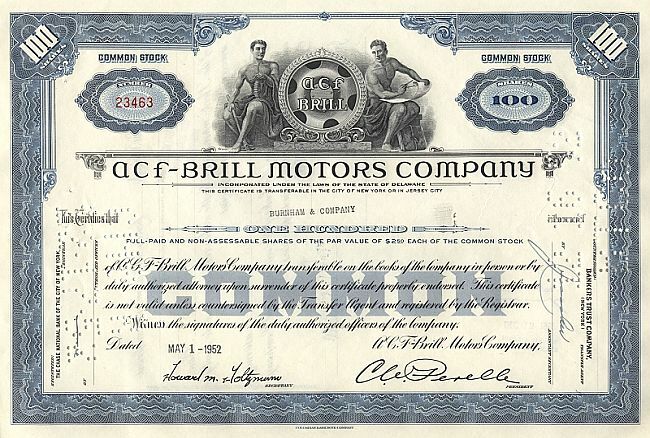 In 1926, AC&F acquired the J. G. Brill Co, a streetcar builder. The J.G. Brill Company produced over 45,000 railroad cars, buses, and trolleys. American Car and Foundry delivers a proud history of quality railcar manufacturing, railcar leasing and sales services. 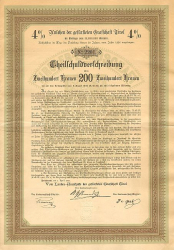 In 1922, ACF expanded into the automotive field. In 1925, AC&F acquired Fageol Motors Co, a bus builder, and the Hall-Scott Motor Car Company, which produced bus engines.